What Is the Darkest Portion of the Moon's Shadow During a Solar Eclipse? We already know Sunday night is probably when you're catching up on homework – or, no judgement, getting hours deep into a Netflix binge. But can we suggest taking a break from the studying (or streaming) to check out the total lunar eclipse? Yup, this Sunday night, you'll be able to watch the Earth completely shadow the moon – and create a gorgeous red "blood moon" effect for just over an hour. And unlike the last total lunar eclipse, which happened last June but was only visible from parts of Asia, Africa, the Middle East and Europe, you'll be able to see this one in person. This weekend's eclipse will be fully visible from North and South America, so you can observe it from your own backyard. And it will be your last chance to see one for a while, since the next total lunar eclipse won't happen until May of 2021. So, Why is This Weekend's Eclipse Special? This weekend's eclipse is worth watching because it's a pretty long eclipse – the moon will be covered in shadows for about an hour and 2 minutes. And it's also a total lunar eclipse. That means the whole moon will be under shadows, which is also rare. So why exactly are total lunar eclipses uncommon? After all, the moon orbits around the Earth about once every 28 days – so you'd think the moon, Earth and sun would align for lunar eclipses more often, right? The answer has to do with the path the moon takes as it orbits around the Earth. Much like the Earth has an elliptical – or oval-shaped – rotation around the Sun, the moon has an elliptical rotation around earth. Because the moon's orbit isn't perfectly round, it takes several rotations for the the moon to line up for a total eclipse – which is why they only happen once every year or two. FYI, the moon's orbit pattern is why we have supermoons that look larger and brighter than normal – because sometimes the moon really is closer to Earth than other times. But back to eclipses. The more "perfectly" the moon, Earth and sun line up, the longer the Earth casts a shadow on the moon. Last year's record eclipse was 1 hour, 43 minutes, which was just about the theoretical maximum time for the total eclipse. At 1 hour and 2 minutes where the moon will be totally under shadow, this weekend's eclipse isn't as "perfect" – but it's still special, since some lunar eclipses last only a few seconds. And the entire eclipse, from start to finish, will last nearly 3.5 hours, giving you plenty of time to observe it. While you might think of eclipses as the Earth "blocking" the moon visibly out of the sky – meaning the moon seems to disappear for an hour – that's not actually what happens. While the Earth's shadow does block out some light, making the night darker and the moon appear dimmer, you'll still be able to see the moon in the sky. The difference? It'll look red – hence the "blood moon" moniker. The red color comes from light that's reflected off of Earth, hits the moon, then gets reflected back to Earth – where it's (finally) detected by your eyes. Because the light has to travel so far (literally to the moon and back!) some wavelengths of light scatter and essentially get filtered out. But colors with longer wavelengths, like red, can travel the distance. So you'll see the moon appear red instead of its usual white. Unlike a solar eclipse, where you need special glasses to protect your peepers from the UV light, you don't need any special equipment to view the lunar eclipse. The eclipse kicks off at about 9:30 p.m. EST, and you'll be able to observe the total eclipse starting at roughly 11:40 p.m. EST. Use this simple guide to figure out when it will happen in your time zone. Then grab some snacks (maybe a MoonPie?) and get ready to look to the skies! Tremblay,, Sylvie. "This Weekend's Blood Moon is the Last One Until 2021 – So Check It Out!" 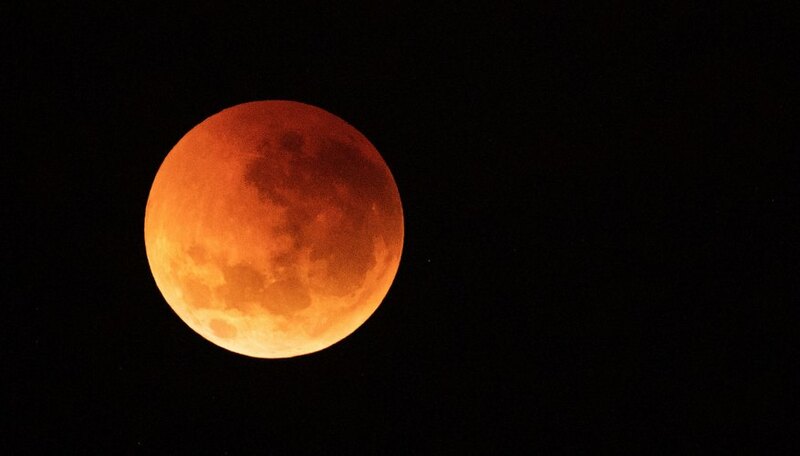 Sciencing, https://sciencing.com/this-weekends-blood-moon-is-the-last-one-until-2021-so-check-it-out-13716650.html. 16 January 2019.